So, Lucy Rocket is quite a sick little puppy. And I am one nervous wreck. You can tell because it's 2:35 a.m. and I am blogging instead of sleeping. We noticed some mild gastrointestinal upset over the last two days, but she was just so darn perky and happy and full of energy, that it was tough to take it too seriously. And then late last night she just started growing lethargic, and then this morning she curled up in her pet carrier and started crying. This was just not right, so the minute the vet's office opened we took her in. Let me be really candid here. 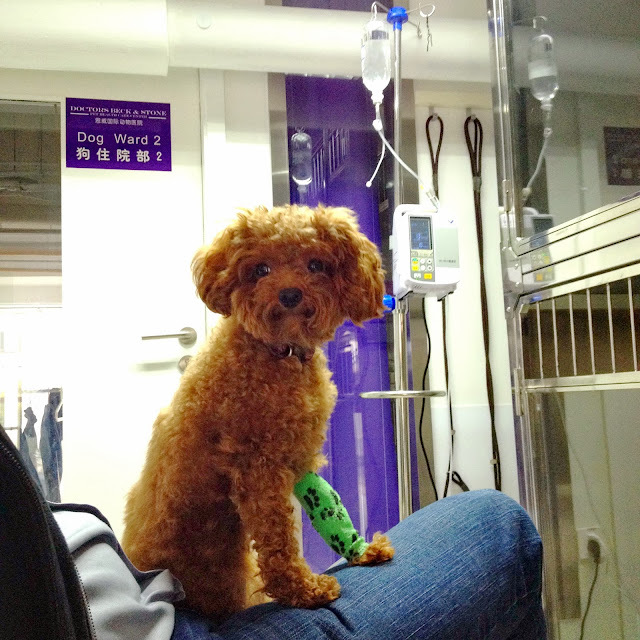 Human health care in China is one thing, but canine health care here initially frightened me, because pets, especially dogs, don't necessarily have the same status here they tend have in some other countries. I have seen dog meat sold here with my own eyes in two different places, both in my neighborhood. Friends around town have posted photos of the same in their own neighborhoods (I have taken no photos and will not do so, nor will I post any here. Sorry). Knowing our pet is something people dine on made me wonder if the veterinary care for dogs would be on par with what it might be in another country where dog isn't a delicacy. I've taken Lucy to two vets here in Shanghai over the last eighteen months. One was the official government vet, which is the only place you can get a rabies vaccination, and one was part of a chain of clinics which employs a blend of international and local Chinese animal care specialists. This being me, I did massive amounts of research before taking her anywhere, and made sure to take her in for a comprehensive well-check prior to needing a doctor for something urgent. I felt quite satisfied with everything I saw, and was overwhelmed by the genuine love and adoration everyone in their clinics, from the doctor to the receptionist, heaped onto every single animal. I also appreciated the western mind-set of care, where the doctor provides as much information as possible along with a recommended course of treatment as well as risks and alternatives to help me, the pet owner, make the decision on how to proceed. So I felt very comfortable taking her to this vet today for this more urgent need. The vet asked and re-asked many, many questions, taking careful notes. He suggested three immediate possibilities, and proceeded to begin some tests, starting with the least intrusive, to try and narrow things down. As a few of the tests came back with negative results, he began the more intrusive tests, like drawing blood after shaving off a patch of her curly fur. After continuing to rule out the most obvious ailments, he narrowed it down to one, a problem with her pancreas, which usually helps with digestion. In her case, it is believed that she's secreting too much of the digestive enzymes which is actually destroying her pancreas and possibly other internal organs as the enzymes have been found floating around her abdominal cavity and causing damage. When positive, the test is about 95% accurate. For a dog her size (2kgs/4.4lbs) this can be rapidly devastating and potentially fatal. This, of course, was not the news any of us were hoping to hear. She was immediately hooked up to an IV, and I thanked God for the foresight to bring along the little bed she always sleeps on which smells of home and comfort knowing she was going to have to stay a few nights away from us. I had Benjamin with me, and hearing the possible diagnosis could be fatal was more than he could handle. He started crying, and then he went outside in the chilly, windy corridor beside the road and paced back and forth rapidly. I immediately called Michael and pulled the Come Home From Work Now card for only the second time in two years, and then ran to the local Chinese grocery to find some baby rice cereal which the vet will feed the dog over the next four days at the hospital. They could feed her the same exact product from their stock at $20 USD a box, or I could go buy my own for 75 cents. It was nice of them to give me that option, knowing the four day stay plus care and treatment is not going to be cheap. After Michael arrived with his Chinese bank card to pay the initial bill, we spent lots of time just holding Lucy and petting her and saying sweet things to her and whispering prayers that she would be okay. Then they took her for an x-ray, which the vet felt indicated there may also be a foreign body in her gut. He gave us a copy of the x-ray to try and identify the object, but our untrained eyes could see nothing whatsoever. Certainly nothing that didn't look rounded and organic and like it was supposed to be there, instead of something square or angular like a LEGO. The game plan is this: she's being flooded with antibiotics and fluids and pain killers overnight at the veterinary hospital, and a new X-ray will be taken in the morning to determine if anything looks different. After 24 hours they will take another test to see what's up with her pancreas, as well as do more blood work to see what has changed. She will be seen by a different vet from the clinic tomorrow. And we'll go from there. The interesting thing about what the vet believes to be wrong is that while there is no specific known cause, most dogs who have this problem are obese, sedentary, and are fed a lot of table scraps and people food. None of that describes Lucy Rocket, who took two full years to get to her ideal weight of 2kgs, and who joins us on long daily walks and has intense and active play sessions with the three guys in the house at various times during the day. And Lucy is fed strictly dog food, with the occasional bit of boiled chicken. None of us have taken this news very well, though we're all showing it in very different ways. Together we are ever hopeful the morning will reveal complete health in our tiny poodle, who will come home and live a long and healthy life with us, her family. Please God, let it be so. Have you given her any treats? Have you heard about what is going on with those things? Cassi, no treats, nothing like what you are seeing on the news. Just imported high quality dog food, the same brand and type she's been eating since she joined our family two years ago. Thank you for asking and for your concern! Heather, she might have swallowed something that is causing this distress! Please have them follow up on that idea! It might be that the abnormal tests are showing a reaction to some foreign object. Dogs are notorious for this! Sending lots of hope and love. So sad to hear she is so sick. My heart goes out to you all. Oh my heart goes out to you Heather! Praying for your precious babie to be better soon! Sound like she might have a lego in her? Can they get it out with out surgery? @PamM - Thank you! Yes, there is a possibility that the test results are caused by something tearing her gut. A second X-ray was just done and depending on the results they will also do an ultrasound. @CEZ- yes, they can get whatever it is out with surgery, if there is indeed something in there. Definitely not a LEGO, the vet seems to think it is shaped like a fluffy cloud, though I could not see anything at all. We go back in about three hours to just sit and snuggle with her and get the updates.